On the 30th August 2012 the amazing, truly special, one of a kind son, brother & loyal friend lost the strongest and bravest battle to cancer. Ross was diagnosed with a rare and acute type of cancer called Medullablastoma aged 18 , and over a long traumatic 3 years undergoing neurosurgery twice, 70 radiotherapy sessions, 23 months of intensive chemotherapy and 3 months of palliative care he inspired all who met him with his unrivalled enthusiasm and love for life, plus his determined refusal to be overcome by the pain and suffering his illness brought. Ross enjoyed life to the full, he thrived on life. He had the unique ability to make everyone around him more loving, more caring, more patient, more controlled and strong. Ross was adventurous, mischievous, full of fun, and an all round sportsman, his thirst for life made a lasting impression on so many. His beautiful smile never faltered throughout his very tough & painful battle, he never complained nor asked for sympathy and this won the hearts of everyone that met him. Ross fought and struggled for life, something we all take for granted every minute, every hour, every day, his strength, courage and determination has created a legacy that his family & friends want to pursue and keep his memory alive by helping other young people with cancer have access to specialised care and live life to the full during their enormous battle against this dreadful disease. 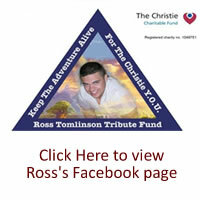 Ross was treated at The Christie Young Oncology Unit in Manchester, The Y.O.U. specialises in young cancer patients aged 16 to 24 and caters for the unique individual needs of these patients when a devastating cancer diagnosis affects a multitude of areas from either their educational studies or newly started careers, to difficulties with their social lives and body image due to changes caused by aggressive treatment. The Y.O.U. creates a unique environment to enable these young patients have as normal a life as possible by supporting them socially, psychologically, countless inpatient activities, provide adventure activities and holidays, as well as care from a specialised medical team. Ross admired the Y.O.U. team and was extremely grateful to them, so much so that he raised over £13,000, astounding his medical team, family & friends Skydiving whilst undergoing aggressive chemotherapy for the Y.O.U. It was also Ross’s wishes to donate the money received from his funeral to the Y.O.U. as it holds a special place in his heart and he always wanted to give something back to them for the unique support, care and special environment they created to keep life ” normal” for him and other teenagers and young adults fighting for their lives. With Ross’s legacy in our hearts we have launched the Ross Tomlinson Tribute Fund and through this website we aim to create publicity and ask for your ongoing support for all the fundraising events we are going to embark on to raise money for the Young Oncology Unit at The Christie. The money you can help us raise is invaluable to this fund that will ultimately help all our unfortunate young people with a terrifying cancer diagnosis. 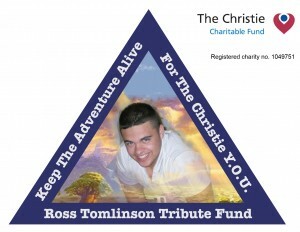 Ross Tomlinson Tribute Fund"Keeping the adventure alive"